We've talked about this game a bit in the game announcements thread. It's been on the fringe of my radar for a while now. I'm not quite sold on it, but it has my attention. To sum up, it's a Smash Bros-style fighting game, developed by Game Arts ( who worked on Brawl) and former members of Team Ninja. It's not a tie-in to any particular Ninja Turtles series, movie or comic. 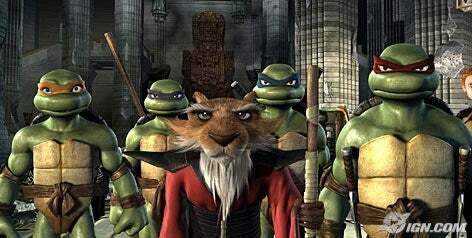 Rather, it seems to be a mash-up of different TMNT continuities. (The art style is based on the 2007 animated film, but the game also includes things like the Technodrome from the 1987 series, and Cyber Shredder from the latest season of the new series). The game also includes an online mode. Ubisoft has made no attempt to hide the fact that they're copying Smash Bros. Brawl. In fact, they seem to be encouraging people to draw parallels, obviously because they want fans of Brawl to get interested in this game, too. 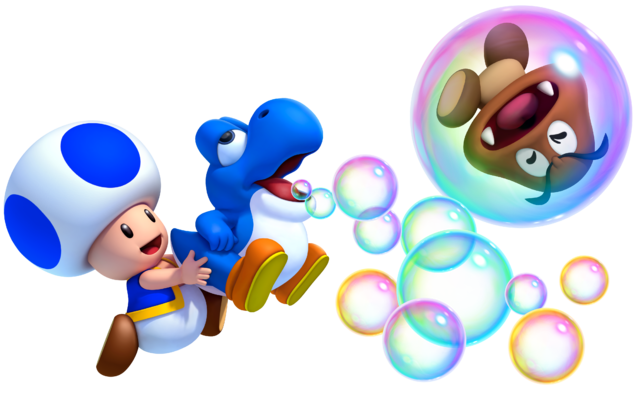 1up held a game night with Smash-Up a couple of months ago, and they indicated that it was a fun party game, but not as deep as Brawl (at least, based on the preview build they had). Here's the official site and IGN's developer's blog. It's currently scheduled for released in North American on September 22, and in Europe on 25 September. Anyway, I was wondering what you guys' opinions were on this game. This game interests me. I wish that they had included some special moves, but I like the Turtles enough to let that go. The character choices they made seem pretty good, though I did do a WTF at the Fuigitoid. All he ever does is run while the Turtles fight off the bad guys. I do hope they make room for some of the lesser known characters like Nobody or Nano. Didn't the Fugitoid have his own comic book before he was crossed over into the TMNT universe, or am I misinformed? Anyway, the only character I would like to see added to the roster that has not yet been announced is Usagi Yojimbo. 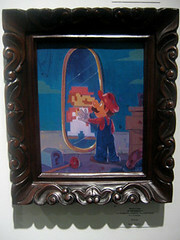 Online Play Developer Diary on Gametrailers. Confirms GCN support in game, a bunch of different modes/options (tag team! ), tournament mode and trophy creation mode. 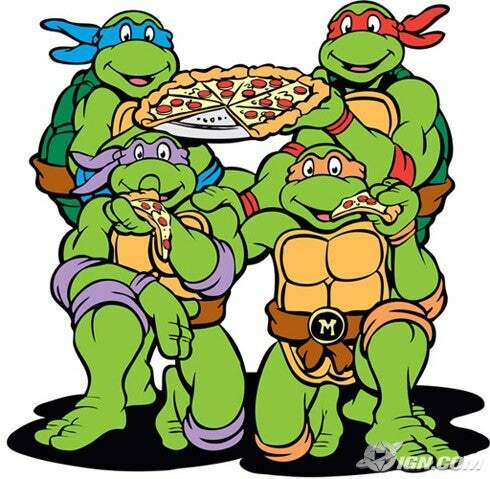 I see that the logo is based on the one for the 1987 animated series, while the looks of the Ninja Turtles are a combination of their looks from the 1984 comic series/2003 animated series and the 2007 computer animated film. The Shredder's look is based on his 2003 animated series look. Yes. 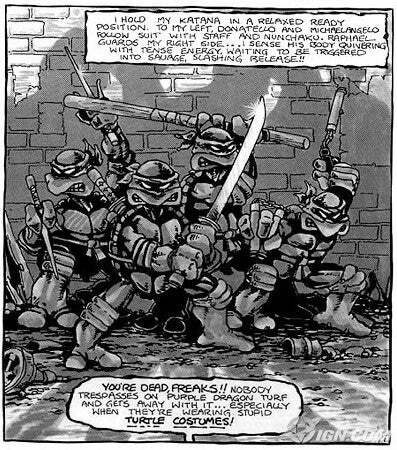 Here is the comic uploaded on the official TMNT website. The Ninja Turtles originally had no pupils (or completely white eyes), which is why I added 1984 comics/2003 animated series to it. According the TMNT:SU dev blog, they used 4 different TMNT art styles. 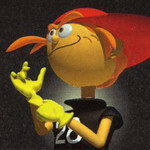 Parrothead is actually very, very correct in recognising the art direction used by the game. 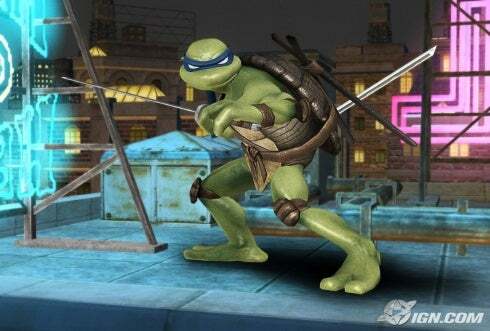 Even if you look at turtles in game, you can see they have the white eyes look, that wasn't used in the 2007 movie, even though they appear to use the same body models. That's what I'm saying. Now I noticed that their 2007 CGI movie looks are probably inspired by their looks from the first three movies and Ninja Turtles: The Next Mutation. In fact, the CGI movie takes place after the third movie (the one the AVGN dislikes). 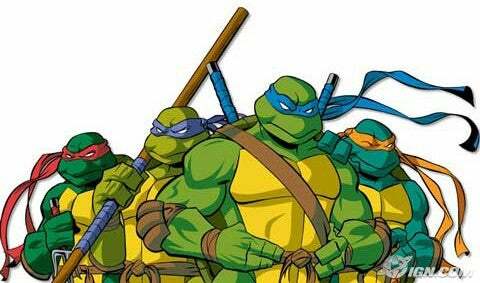 Recently, their 4Kids looks have changed for some reason in the new season titled "TMNT: Back to the Sewer". They now have pupils, unless if they enter the cyber world. While thinking about this, I remember when they had pupils at young ages whether wearing their headstraps or not, but at their adult age (after watching the episode where Donatello met the artist with a jewel-straped pencil), their pupils can only be seen with their headstraps off. Here's hoping for Venus de Milo!